Who has time for cutting up fruit or actually letting wine chill? 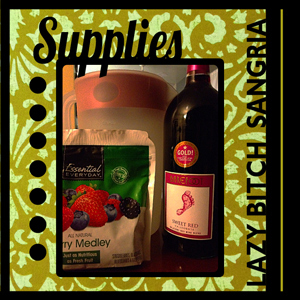 Here’s a super simple instant-gratification recipe for sangria. Put the frozen berries in the pitcher. Pour in the wine in the pitcher or punch bowl. If I’m going to be serving this immediately, the first thing I do is put a few frozen berries in each glass then the rest go in the pitcher. Then I pour the mixture into the glasses. For parties this is best served in a punch bowl with a ladle so people can scoop out their own berries. I also keep spoons handy because the wine-soaked berries are the best part! Previous Coming Soon! Like tomorrow. Next Easy NO-SEW Cape: How to make a cosplay cape for beginners.